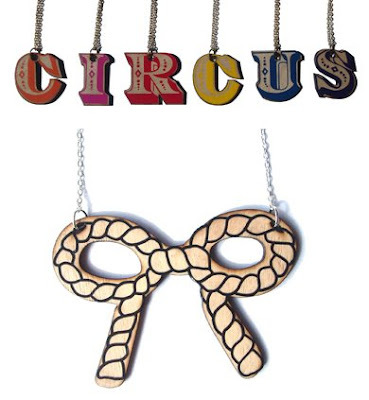 I love this latest discovery from Scottish designer Haberdash House - I especially love the circus-style letters. I wear a variation of the same outfit almost every day (white vest, navy/blue cardigan, skirt) and so I'm a great fan of statement jewellery to make myself look a little bit different. In fact, in my new job, one of my new colleagues said to me after two weeks "So, do you like blue then?" as I'd worn it every day. It's a little too late in life to be developing an edgy look (I just lack the inherent 'cool' factor) but I do like to look out for interesting necklaces and pendants. very cute! I agree i like the circus style letters aswell. But yes, the circus letters are lovely.